The show, Friends, was once one of my favorites, and a particular episode related to this topic sticks out in my mind. One of the characters decided she was just going to run through the park with the sheer joy and style of a child. If you saw this episode, or if you can simply imagine, the sight of an adult running through the park with arms flailing uncontrollably and seemingly no control of themselves is hilarious. Now I'm not suggesting that's the example of getting up and moving that we set, but it does help to illustrate that for a child, moving is just unfiltered fun! It's a bit of a shame that we lose that as we become adults. So if you are brave enough why not reconnect with the notion and try to "run like no one is watching"! Hopefully you knew about or even took part in Global Running Day. The point was simply to decide to move, regardless of how far or how fast you can go, and kickstart a healthy habit. Talk about a support system...just ask your child to move with you and it is on! So make the effort to give that invitation, for you and for them. We celebrate one Global Running Day, but everyday is an opportunity to start moving. 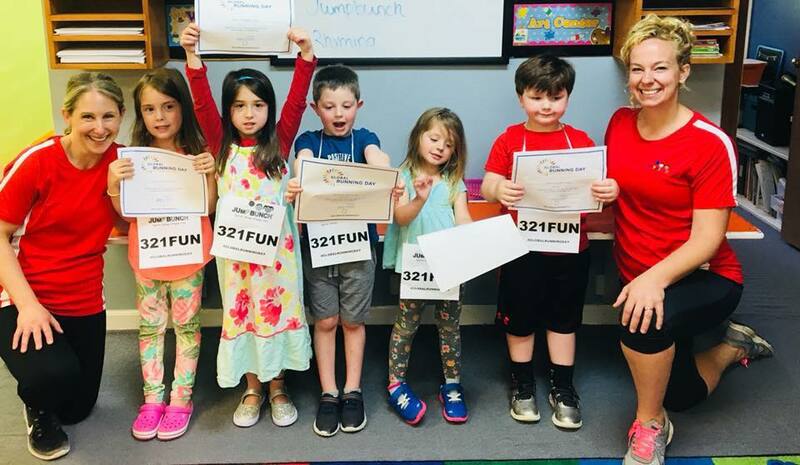 Here are a few of our recent JumpBunch runners from Connecticut after Global Running Day classes. Great job!